Additional research provided by Gene Purcell and Douglas A. Wait. Decline, mergers, and takeovers marked the North Carolina textile industry beginning in the 1980s, with Fieldcrest buying Cannon Mills, West Point-Pepperell buying J. P. Stevens, and Burlington spending millions to block takeover efforts. Often, the changes proved painful for employees, who lost jobs and sometimes benefits such as company pensions, and for communities built around textile operations. Between 1975 and 1985, more than 800 mills closed nationwide, and employment in North Carolina's textile mills fell from an all-time high of 293,600 in 1973 to 211,300 in 1986. Many former textile mills have been transformed into housing or retail shops or have met the wrecking ball. The effects of numerous free trade agreements, notably NAFTA in 1994 and treaties with African and Caribbean nations in 2000, led to a vast increase in textile and apparel imports and, consequently, numerous plant closings in North Carolina. Approximately 100,000 jobs were lost in textiles in the state from 1997 to 2002, with an additional 70,000 lost in the apparel industry during that same period. In 2003 one of the biggest job losses in North Carolina history occurred when Kannapolis-based Pillowtex closed five plants, eliminating 4,000 jobs. Burlington Industries, mired in debt and struggling to emerge from Chapter 11 bankruptcy protection after years of being pounded by cheaper Asian imports, spent $3.5 million in 1998 for a stake in a small company using nanotechnology-the ability to manipulate individual atoms to create new materials-to produce fabrics that repel water, wine, and other liquids. In 2004 New York financier Wilbur Ross purchased Burlington Industries, which became, along with Cone Mills, part of the giant International Textile Group. By 2006 the North Carolina textile industry had begun to focus on new technologies and specialized products outside the realm of apparel. Students at N.C. State's College of Textiles, for example, were working with high-tech fabrics that can withstand heat and force and textile products ranging from artificial hearts and optical fibers to under-coverings for roadways. Many large textile companies, facing continued high labor costs and trade deficits, began to establish a future built on marketing technology to other companies rather than on actual production. Mildred Gwin Andrews, The Men and the Mills: A History of the Southern Textile Industry (1987). Brent D. Glass, The Textile Industry in North Carolina: A History (1992). Jacquelyn Dowd Hall and others, Like a Family: The Making of a Southern Cotton Mill World (1987). Harriet L. Herring, Passing of the Mill Village: Revolution in a Southern Institution (1949). 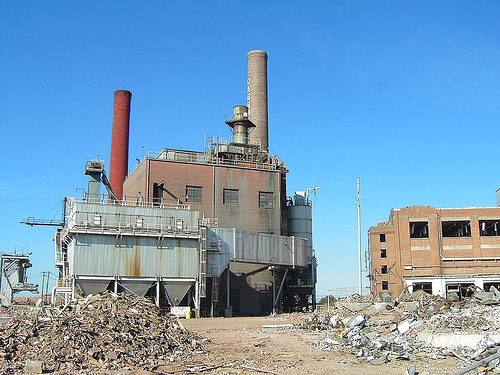 Demolition of Fieldcrest Cannon Mills, Kannapolis, NC, 2004. Image courtesy of Brad Spry. Available from http://www.flickr.com/photos/bradspry/124498560/ (accessed October 2, 2012). 1 January 2006 | Glass, Brent D.; Kress, Kelly; Purcell, Gene; Wait, Douglas A.